Today begin's the first of our new 'Bardic Meets . . ' series. Over the next few weeks BardicTheatre.com will be dropping in with cast & crew to chat to them about All Shook Up, their characters, favourite Elvis' numbers and more . Today we meet the ever lovely Lauren McCrory from Galbally. Hi Lauren, Thanks for taking the time out to chat with with us, here we go . . .
1. In All Shook Up you play Natalie and Ed, how do you end up playing two characters in the one show? Natalie is a character that you warm to early on in the show! From her tomboys ways at the beginning to her wearing dresses and disguising herself as a boy to try impress and her crush Chad, we really see her develop as a character throughout the duration of the musical! Chad comes into town and turns Natalie's world upside down as she falls head over heels in love with him and try's everything in her power to impress him. Chad however is not interested in Natalie but is in fact in love with museum owner Miss Sandra. Natalie then sees that Chad likes to hang around with the “cool guys” and due to this she disguises herself as “Ed” to become closer to him and becomes one of Chads' best friends'. Eventually Chad then finds himself in a love triangle as he is finding that he has feelings for both Miss Sandra and Ed and it's all guesswork for the audience from there on. 2. What else can you tell us about Natalie? 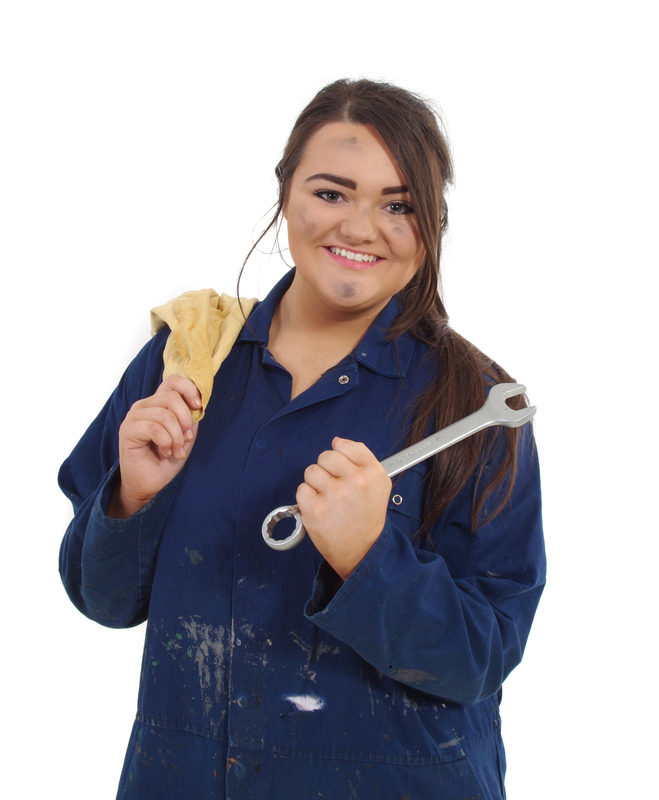 Natalie is a mechanic who grew up with her widowed father from a very young age so she has adapted to his way of living. Her style of life would not be your typical girly girl. She is more relaxed with who she is and could put her hands to anything. She is a character that is loved by everyone in her town and is known for her mechanical ways so when she wears a dress to impress, Chad, the townspeople are very shocked and confused on what's changed her. For me personally I can relate to Natalie and her personality as she's very similar to me, there have been times when I have read the script and thought “that's such a me thing to say” so I feel a deep connection with my character. 3. What do you think is the one quality in Chad that really makes Natalie flutter? I suppose there are a lot of traits that Chad has that Natalie falls in love with but I think the main attraction for me would be the fact that he encourages Natalie to follow her dream and go after whatever she may want in life. Natalie is very passionate about her dream so when she realises that Chad understands how much she wants it she falls more in love with him more than ever before. 4. What's been your favourite Bardic role to date? I have been in the Bardic Theatre now for five years. My first production was “Joesph and the Amazing Technicolor Dreamcoat”. From that I have been in Oliver, From Broadway to Bardic 1 and 2, Rock of Ages and I'm delighted to say that every year I have played some fantastic characters, but I would say my favourite role I played would have to be Velma from Chicago in the original From Broadway to Bardic. The morning that Stephaine (our director) told me I was singing 'All That Jazz' and 'Cell Block Tango' the first thing I thought was “I can't dance!” but it was a challenge and that's something that I love! I was determined not to stand out as the “non-dancer” and so I practiced and practiced but never got the dance right until the opening night of the show. From then on the adrenaline kicked in every evening and as the show weeks continued I enjoyed each performance more and more! 5. Your also a contestant currently on TG4's Glóre Tíre, all of Bardic are behind you, how have you found managing the balance between that and rehearsal for All Shook Up this past while? It's been a hectic few months to say the least! From going to Galway recording for Glór Tíre to being at rehearsals for All Shook Up and other shows it has been mental! Glór Tíre definitely is taking up a lot of time in regards to campaigning myself, singing at different concerts and running the roads putting up posters and handing out flyers but thankfully it hasn't clashed with the dates of the show meaning I can put my full attention on Natalie's performance. Luckily All Shook Up finishes on the 18th of Feb and I'm back on Glór Tíre the 28th of Feb so I have a week to push my campaign as much as I can to get people to tune in and vote for me!! The voting lines are open right up until the 14th March so if you would like to vote for me text GLOR8 to 60999, call 09016566108 or download the Glór Tíre app and receive 5 free votes! 6. And finally what's your favourite Elvis song from All Shook Up, oh and don't forget to tell us why? I think my favourite song from the whole show is most definitely “Burning Love”. The energy in the music of this song is brilliant and really gives you that "feel good" factor especially when you add the choreography and I think once the audience hear it they’ll be up on their feet dancing from the get go! Lauren thanks for taking the time out from a very busy rehearsal room to chat with BardicTheatre.com ahead of next weeks opening night and 'Break A Leg' as they say!